News - Frontierville Express - More Than Just A News Site: Inspection Time! The March to Statehood is continuing unabated tonight but it's time we all tidy ourselves up and look smart, Inspector Hatchet is arriving on the homestead and he's going to be judging us to make sure we're good enough for Statehood! That will kick off a series of mini threads that will work alongside each other, 3 threads of four missions to help get the homestead all tidied up... (all details HERE). As usual for this kind of mission there's no build, but we will see two placeable decorations. The first of these is the Inspectors Carriage. This one will contain the Quests menu to be able to access all the missions. 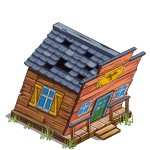 This little doohickey comes with a special power, the ability to get our hands on more free gift crops every day by buying them with tokens that will drop from the generator and items in this thread! Extra crops, no requesting! As for features in the missions themselves, they're all ones we'll understand. The first series will introduce a new pair of healables as we attempt to do up the homestead. The first is the Hazardous Building which, when healed, then drops the Trash Pile. And the final series brings a new varmint, as there's a dark and mysterious figure trying to ruin the inspection by spreading graffiti! To see what each requires, check the mission pages. There's also exciting news for Express as we'll soon be seeing the fruits of one member's labour as the winner of the Express Flag Design Contest reaches the game! ...and the second one is more generic, rewarding us for collecting from Decorations! So, what are you waiting for, front and centre, stand to attention, it's inspection time!